My economics textbook says that demand curves slope downward - but then goes on to say that when demand increases, prices go up! Does anyone else find this confusing? Edit: from the small number of answers I have received, it seems that this is not a well understood issue in economics. Is anyone aware of alternative approaches which avoid this contradiction (e.g. I have heard that the Austrian School does not use demand curves)? 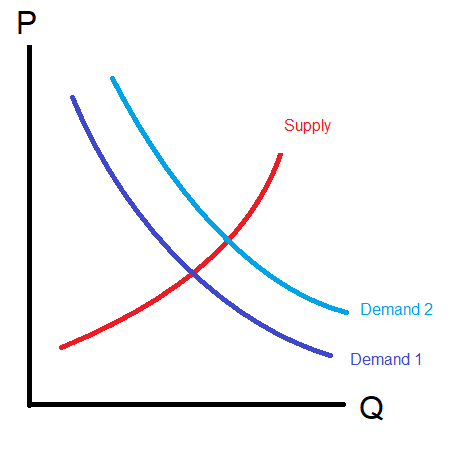 Separate the concepts "an increase in quantity demanded" from "shifting of the demand schedule". The second means that for some reason, say change in tastes, preferences, the whole demand curve shifts: now, quantity demanded for the product has increased for all price levels, compared to the previous situation, but of course the downward slope remains. "Demand curves slope downward - but when demand increases (in the sense of shifting the whole demand curve due to, say, a change in consumer preferences), equilibrium price goes up". Linearisation of the IS curve?